Looking at a photograph places us at the edge of a certain time. Neither the moment before or after. Yet, this singular moment, ever present, ever still, evokes a boundless space, alive, in motion. The dead are somehow conjured into life. And yet again this very magic makes their death all the more certain; our loss stares us in the face. We might better describe the boundless boundary of the photographic image as a peculiar frontier – ‘a region that forms the margins of settled territory’… – where the flora and fauna of the past, present and future are captured in one compact space. It seems to be part of the historian’s craft to fill in the background, to describe the past that is, before being named, an invisible and apparently empty space. The act of interpretation enters this space. There is always the differentiation between my present day ‘self’ and the historical/cultural ‘other’. In the Australian Town and Country Journal published in November 1901 these two photographs appear. They were taken at Sydney’s Ashfield Infants Home which was celebrating the opening of its new wing. According to the Australian Women’s Register the Sydney’s Ashfield Infants Home, established as the Sydney Foundling Hospital in 1874 and became the Infants’ Home in 1877. It assumed responsibility for the care of infants of single mothers and destitute parents and provided a temporary home for the mothers. Rules for admission established in July 1874 ‘required firstly for each application to be dealt with on its merits; secondly, for the infant to be no older than three months; thirdly for the mother to produce satisfactory evidence of her previous respectability and fourthly there had to be proof that the father had deserted the baby and be beyond the reach of the law to enforce him to support it’. 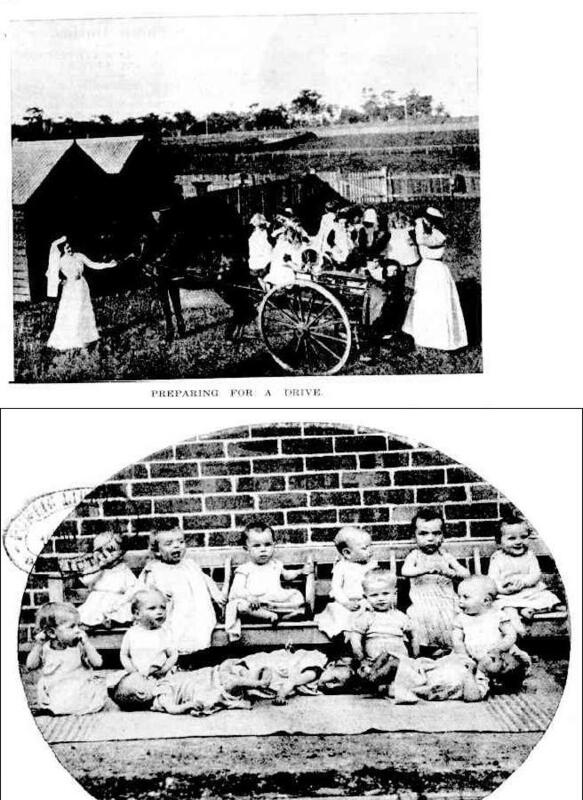 The lower photograph shows thirteen of some forty children residing in the Home where , despite being ‘some of the happiest and best cared-for youngsters in Sydney’, they lacked parents, relatives and names – excepting that their guardians have bestowed upon them. These are the foundlings, stumbled upon by a policemen or left at someone’s doorstep. No one ever sees the person who left it there – a reporter wrote. There is never a clue to its identity. Mother and infant are lost to one another. But, the Town and Country these children had a great claim upon society ‘by reason of their absolute helplessness’. And so begins an account of the Home as a showpiece of all that is ‘best practice’ that was early twentieth century child rearing at a time when, according to well known Adelaide doctor Helen Mayo, infant mortality was high – particularly amongst the children of unmarried mothers. Two or three years before reports from the Child Study Association, formed in Sydney in 1898 had begun to focus on infant behaviour, the sounds and gestures they made as communication. Following developments in the United States and United Kingdom well known anthropologist Professor Alan Carroll gathered a group of interested men and women to meet with the purpose of studying the child mind. 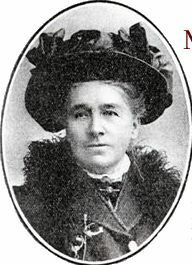 During the next two decades the Association included leading educationists and welfare officials as well as drawing interest from feminists and women leaders such as Maybanke Anderson. More recently historians have been exploring the intersection between psychology and emerging ideas about children in the nineteenth and twentieth centuries.The historian Sally Shuttleworth’s The Mind of a Child published in 2012 explores ideas about infancy and childhood during the nineteenth century Dickens’s Oliver Twist, Eliot’s Maggie Tulliver, Charlotte Bronte, Jane Eyre and Edmund Gosse’s autobiographical account of his childhood illustrate the growing apprehension of children as having different and separate lives to those of the adults around them. Missing from her account is Thomas Hughes’s 1857 classic: Tom Brown’s Schooldays, about the world of boys and school but this is a minor quibble against the richness and thoroughness of Shuttleworth’s research into the development of nineteenth century psychology. The ‘current cultural dominance of Freudian theory has tended to obscure the interesting pre-history of child psychiatry in the second half of the nineteenth century’, Shuttleworth writes. (p.18). She points to Charles Darwin’s observation of one of his children in 1840, published 37 years later in the journal, Mind, as a response to M Taine’s essay ‘The Acquisition of Language by Children’. M Taine established the practice similar to what has become known as Infant Observation. The observations, M Taine wrote, ‘were made from time to time and written down on the spot.In his study the subject of them was a little girl whose development was ordinary, neither precocious nor slow’. He detailed each movement, moment by moment. M Taine’s account of a baby’s discovery of herself in the world prompted further investigations using child observation In 1898 An American woman, Millicent Shinn , building on the work of the psychologist G. Stanley Hall, published the observational study of her niece, ‘The Biography of a Baby’.Shinn’s methodology also drew on the work of Dr Joseph Le Conte on a daily basis from birth, drew was a response to the notion that through scientific observation one would that ‘children in developing passed through stages similar to those the race had passed through’. Even so, Social Darwinism which placed white society at the top of the tree relative to asian and aboriginal societies remained a strong underpinning in people’s’ thinking about children. During a visit to the Ashfield Babies Home in 1903, the writer “Barbara Baynton” wrote of her encounter with a small boy, ‘Australian born of Indian Parents’. 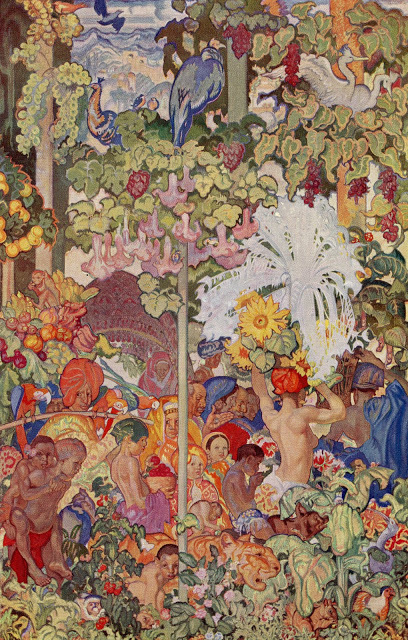 In his 1930s publication, The Civilising Process Norbert Elias also argued that in the latter half of the nineteenth century children were increasingly seen as less as little adults – as when the philosopher Erasmus was alive in the fifteenth and sixteenth centuries – but as children in their own right. Increasingly they were separated and segregated from adult concerns. The development of orphanages segregating children from the adult world of the workhouse were one response. 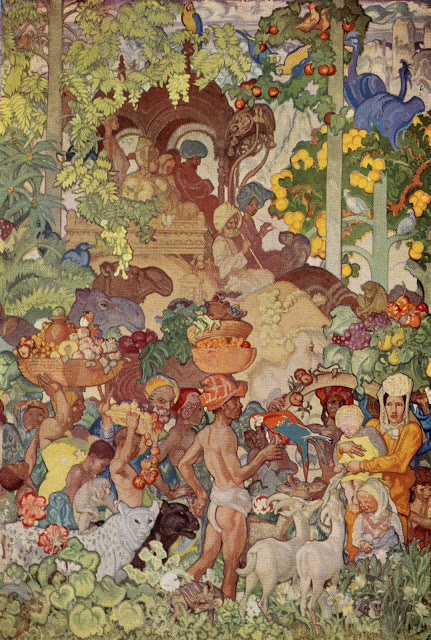 An Infants Home – a space where small children were raised until they were ready for adoption or fostering – with air and light, space to breathe and the provision of good food was considered essential. It was far away from the dingy crowded squalor of the workhouses and the orphanages were children were herded without maternal care. Such children ‘never grow properly if you have the lot of them together’, wrote English activist, Florence Davenport Hill in her 1867 book, Children of the State. ‘They only grow up into half-idiotic men and women’.In overcrowded conditions even a ‘good nurse was unable to relate to each child as an individual. Nor was there time to ‘draw out the intelligence of every child and nurse it as it would be nursed in a family home’ ( p.235). So what do we see in the photograph of the thirteen babies at Ashfield? One of them is crying. Another looks solemnly into the camera. Are there others not ready to sit up? There are so many of them. We wonder who is caring for them and wonder about the impact of parental loss upon the children. For the reader in 1901 it is clear that the Home is a triumph, the photograph of healthy active babies a tribute to the modern techniques that are being followed in the care of the children, some of whom were very ill from neglect and starvation when they arrived. The emphasis is upon luck. The idea is that environment rather than heredity will prevail and ultimately help the children to live better lives. 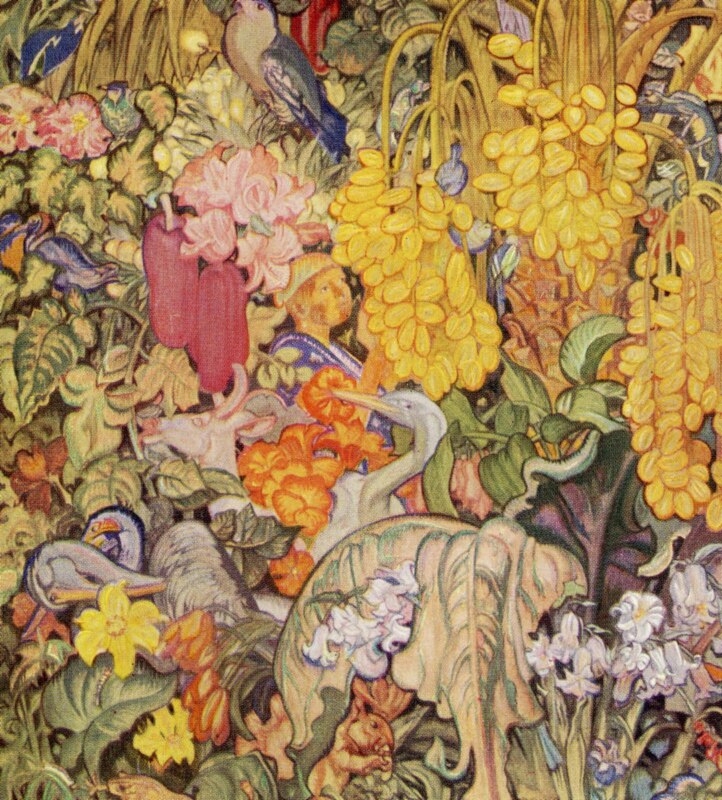 We learn about the physical surroundings of the Ashfield Home, the flowers and trees evoking a sense of fecundity and care. But there is also the beginning idea that environmental provision also means psychological provision. There is the perception that loving care is best for children. We can be assured that all is well. The staff are trained: ‘duly qualified in the difficult art of nursing children’. Unmarried mothers also reside in the Home performing domestic duties – *the more reliable ones* assisting with the children. And at the Home they remain, these babies, until they are around three years old when they are taken over by the government and boarded out to foster parents. For readers in 1901 these were lucky children. Jed Sekoff, ‘The Undead: Necromancy and the Inner World’, in Gregorio Kohon, (ed), The Dead Mother: The Work of André Green, Routledge, London, 1999, pp. 109 – 127. Florence Davenport Hill, Children of the State 1867.